A common question from homeowners is “What does crabgrass look like?” This weed is so invasive and troublesome, that just the thought of dealing with it can make you shudder. All the more reason to know for sure when you suspect it has shown up. Early treatment can prevent a lot of difficulty later. Identifying crab grass can be a problem because of the assortment of portraits it can claim. It has many faces, due to its ability to adapt to various growing circumstances. You may have seen a crabgrass picture or two, but as it adapts, it can take on an appearance quite different from the norm. This article will discuss the obvious things that will help you identify crabgrass in your lawn or garden. Crab grass gets confused with other weeds. Sometimes the names crabgrass, devil grass, and quack grass, plus Bermuda grass, are used interchangeably among all those plants. Use the following guide to compare with the invaders you see in your lawn and garden. To assist your efforts in crabgrass identification, after reading this article, check out our Photo Gallery of Crabgrass Pictures. This presents crabgrass photos in various stages of development, and under different conditions. A crabgrass seedling resembles a small corn plant when it first appears, and many are familiar with that image. The leaf blades are ¼” wide or more, which is about the thickness of a pencil. In contrast lawn grass, and most grassy weeds, have a very thin blade when they sprout. The blades angle out from the stem, which continues to grow up as new blades appear. The seedling very quickly starts to develop side shoots, and these grow out as separate branches. As the stem grows, the leaf blades can appear farther apart. This is very different from many grasses and weeds that send up their blades from a central point. As the stems, or branches, get larger they tend to fall to the ground, and start growing out in a star pattern. The center of the plant may be left exposed for a time, showing the star effect, and this is a common picture for identifying crabgrass. The plant will continue to put up new shoots from the center, even as the first shoots continue branching out to the side. This abundant growth pattern eventually leads to a thick mat of weed, and eventually a large clump, unless it is mowed. The actual growth pattern of crab grass is affected by growing conditions, like how much sun and moisture it gets. Other plants or grass competing with the crabgrass seedlings will also influence how they grow. Crabgrass likes sunny, bare spots. The best way to encourage an infestation of crab grass in your lawn is to allow thin or open areas to develop. Crabgrass is one of the first weeds to germinate and get a head start on any competitors. It can and will, however, sprout at any time throughout the warm growing seasons. If it sprouts in an area with competition it tends to grow more upright for a while. In lawn grass, or surrounded by other weeds or crabgrass plants, it strives to get up into the sun and overshadow everything. This weed loves to sprawl out and start to take over. With plenty of sun and water it grows out, up and thick very quickly. If it gets less water, it will still send out side branches, but the plant remains thin and straggly looking. If it gets less sun, it will tend to grow upward, but appears thin, weak and is less of a threat (until it sends up seed stalks). New seedlings will usually appear a light, emerald green color. This color will tend to remain in plants that get less sunlight. The more typical plant will become a medium to dark green as it grows. This can vary tremendously, so color is not a good clue. Some crabgrass will show purplish streaks on the stem, most noticeable when the plant sprawls and spreads out. This purple color also becomes evident as the plant reaches maturity, and as cold weather sets in. This troublesome weed will often show a blue-green tint. When growing in drier soils, it will tend to become more bluish-grey in color. It can vary from plant to plant, even when separated by just a short distance. The color and growth habit of crab grass can vary dramatically in your lawn. This weed may blend in easily with the color of the grass, or be quite different, depending on the grass variety and how well fertilized it is. Crabgrass that has excellent growing conditions, especially enough water, can look like what you expect any grass to be, as the new seedlings pop up. Then as it gets older and larger the thick mats don’t look like they belong in a lawn. 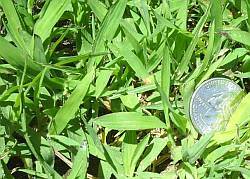 The leaf blades are much wider on crabgrass than lawn grasses (except perhaps St. Augustine), and the blade has a fold line down the center. The blades grow from separate locations on the stem, instead of from a central point. They can be rather short, or extremely long. After mowing your lawn, crabgrass will tend to grow up faster than the lawn grass, leaving it looking rough and unkempt. However other grassy weeds have this same characteristic. Some lawns are intermingled with a clumping grass that people call crabgrass, but it can be a type of fescue. Often this is a variety that was the only one to survive from a blended fescue lawn that deteriorated. Lawns get over-seeded with different grass types, which may have a finer texture than the clumping fescue. Fescue will grow more upright in a tight clump. Crabgrass sprawls. Crab grass in a lawn that is mowed regularly will quickly resort to a low, spreading growth pattern. 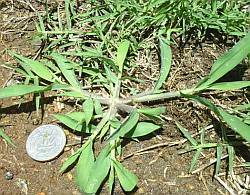 Crabgrass that is not cut will grow somewhat upright and can form a dense clump out of which it will send out long leaf blades and very tall seed stalks. As this picture shows, crab grass usually displays a much wider blade than Bermuda grass. There are many varieties of Bermuda and some of them will have larger blades and thicker stems than this sample. But generally Bermuda grass will be significantly finer in texture than the crabgrass. Bermuda may become dense, but mostly spreads out evenly with its runners. It doesn’t form clumps or mounds like crabgrass. As It Puts Out Runners And Seed Stalks? Crabgrass will send out stolons, or runners, to conquer more territory. As the stolons, or branches, spread out, they often make angular turns. They can take on the appearance of crab legs, hence the name. These shoots, or runners, can put down new roots at each node, if it is the large or hairy crabgrass variety. This makes it more difficult to remove the weed as it gets older and more established. At each node or joint new branches can grow out and up. This can greatly increase the size of the original crab grass clump. It also allows the crab grass to very effectively smother the lawn area that surrounds it. These images show how the stolon puts roots down and branches up. Eventually it will put out a tall seed stalk. More seed stalks will shoot up from the center of the plant. As It Spreads And Matures? As the plant matures, it can become a dense clump that smothers everything around it. There are two main varieties of crabgrass found in North America. Small, or Smooth Crabgrass, (Digitaria ischaemum) is common to the northern areas. It has smooth stems, a more prostrate habit of growth, and an average height of 1 to 6 inches. Large, or Hairy Crabgrass, (Digitaria sanguinalis), is also called Purple crabgrass. It is found throughout the United States and southern Canada. This variety has hairy stems and a more upright growth habit averaging from 12 to 48 inches. However, it does adapt and grow prostrate in a mowed lawn. Both types put up seed stalks throughout the growing season. Many common garden weeds will produce only one batch of seeds when mature, then die. Crabgrass will continue to produce seeds until cold weather. Bermuda grass also does this, but crabgrass has much larger stems on which the seeds form. The worst stage to be trying to determine what does crabgrass look like is the mature stage, as it fully puts its attention to forming seed stalks. At this point, the damage is done. The lawn will be dead under the crabgrass, and seeds are distributed for next year. But at least you know what you are dealing with now. Does it really matter if it’s crabgrass, or just another weed? Yes, because it is so difficult to control. Learn why crabgrass is such a nuisance in this article Getting Rid Of Crab Grass. When you can finally answer the question, “What does crabgrass look like?" -- it’s time to eliminate it. See Tips For Killing Crabgrass. And remember, a healthy, thick lawn that is mowed, fertilized and watered correctly is able to resist most weed infestations. Plan for that to be your defense, so that you only see crabgrass in pictures in a book, instead of your lawn! Here is a post-emergent, selective weed killer for grassy weeds delivered in a new product form. Each box contains three granular concentrate packets, and each packet's contents dissolve in a 1 gallon tank sprayer. The active ingredients are, Quinclorac (a very effective high concentration) plus Sulfentrazone, which combine to make a powerful crabgrass killer that also controls many broadleaf weeds and sedges.